Acer E140 beTouch finally officially announced by Acer. 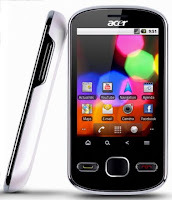 As expected earlier, Acer beTouch E140 will be launched and compete in the smartphone market armed with the operating system Android 2.2 a.k.a Froyo. Other specifications that participated brought by this Acer brand-new smart phone, including 2.8-inch resistive touch screen with a resolution OVGA, 3.2 MP camera, and processor 600 MHz. Not only that, the phone who jumped to the middle segment also features an adequate connectivity with support HSPA, Wi-Fi, Bluetooth, and other important features such as GPS. Interestingly, to pamper its users, the Acer beTouch E140 been embedded various complementary applications, such as Acer Spinlets streaming that allows users to listen to music from record labels and memostingnya instantly on your favorite social networking users. There are also applications nemoPlayer that will provide much pleasure for users with multimedia content. Do not leave it at that, for users who want to be different in social networking favorite, can add a profile with a 'virtual you' by Acer UrFooz application which is also available on Acer beTouch E140. Reportedly, the Acer E140 beTouch will be thrown into the market at a price of 200 euros. But unfortunately, when Acer's latest phones will be available remains a mystery. For that we wait further news.